After a typically grey and stormy March here in Maine, I’m ready for a little sunshine. 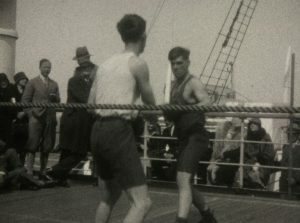 So let’s break out the cocktails, brush up on our shuffleboard skills, and take a look the sea faring adventures of some of the women in Northeast Historic Film’s portion of the The Woman Behind the Camera collection. ‘Crossing the line’ aka sailing across the equator, is considered a rite of passage among sailors. When a ship passes this mark, many ships would hold a ceremony to appease ‘Neptune’ usually a crew member dressed as the Roman god of the sea. This generally consisted dunking people in tanks, pies to the face, and a bunch of other hijinks that today look an awful lot like fraternity hazing. Which is basically what it is, inducting landlubbers into the brotherhood of sailors. Guests on passenger ships were also sometimes included in tamer (usually) versions of this ceremony. We get some very detailed shots of this ceremony in the films of the Adelaide Pearson collection. Cunard Lines has operated passenger ships between Europe and North America since the 1800s. The LeGrand Cannon Collection, the Gertrude Jane Hay Eustis Collection and the Adelaide Pearson Collection all feature at least a few shots on board these vessels. It’s rare that the particular ship’s name will appear on film. 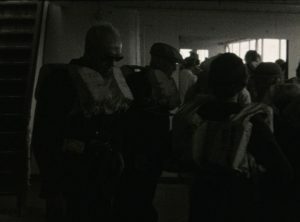 If we are lucky a shot will include a life preserver mounted on a wall with the ships name, or a kind donor will include the ships name in their notes. 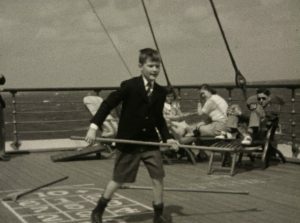 If not, I tend to spend a lot of time scrolling through the list of Cunard Line’s retired ships, comparing dates and routes to try and get an approximation of which ship the filmmakers traveled on. 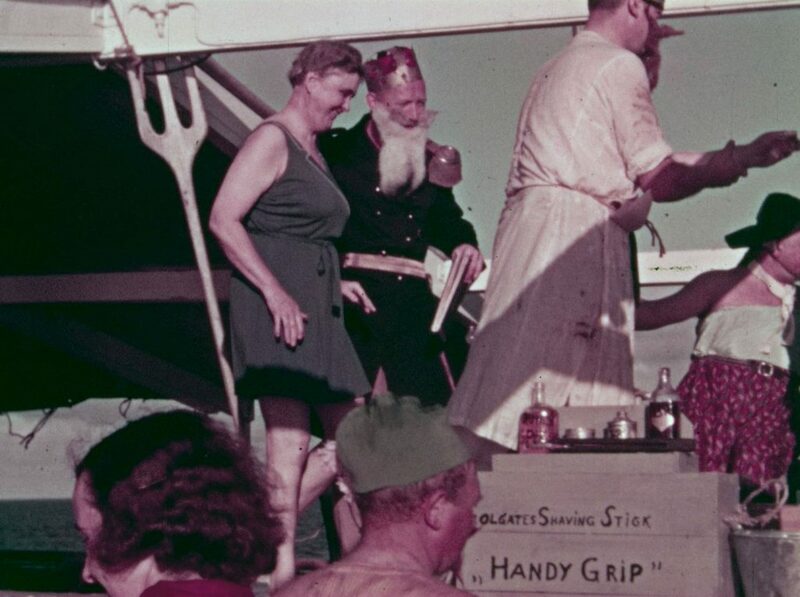 Vintage photographs taken onboard Cunard Line ships often include scenes of glitzy ballrooms and celebrities drinking cocktails. The scenes we see in the Woman Behind the Camera collection tend to be less glamourous. People on deck bundled up against the cold. Others lined up in life vests during a safety drill. A tug boat slowly moving the ship away from the peer. Not everyone who traveled went in first class, and it wasn’t always a party. Traveling by steamship was not without peril. 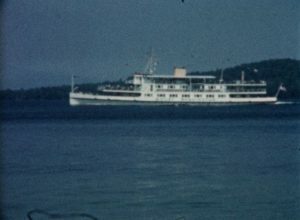 Many of the ships shown would later see service in World War II. The RMS Carinthia, featured in the Gertrude Jane Hay Eustis Collection, would later be sunk by a German submarine off the coast of Ireland in 1940. Accidents also happened. The wreck of the SS Morro Castle, seen for a few frames off the coast of New Jersey, caught fire in 1934, killing 137 people. Besides the big ocean liners, smaller pleasure craft are also in abundance. 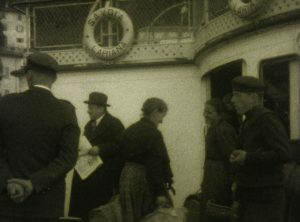 Boats like the Savoia, a long running cruise boat on Lake Como in Italy, filmed by Jeannette Peabody Cannon. The MS Mount Washington, which has plied Lake Winnipesaukee in New Hampshire for decades, shows up in several reels. And of course, there are the innumerable scenes of sailboats, yachts and fishing boats along the New England Coast.